In all, three trees were planted on 23 February 1998 were the Meridian crosses the Louth by-pass (A16). Believed to have been donated by Crowders Nurseries they were marked with Millennium Tree Line (MTL) discs. 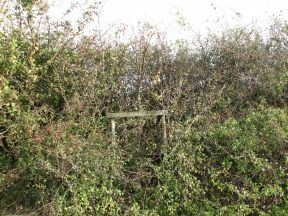 In recent years, this one (the most northerly of the three) has become increasingly subsumed into the hedgerow. Of the others, one is on the same side and one on the opposite side of the road.